Article Highlight: When Is the Best Time to Plant Roses? Perennials are plants that come back year after year. When it comes to choosing varieties, gardeners have plenty of options. There are many native and old-fashioned plants that are among the most long-lived and reliable. And every year, plant breeders come up with exciting new cultivars for us to add to our gardens. Perennial gardens are so interesting because they are always changing. Plants come in a variety of shapes, sizes, and colors. They grow and bloom at different times. A carefully chosen array will provide a procession of ever-changing color and form, lasting from early spring all the way through winter. 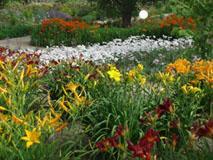 An attractive mixed garden includes plants of different shapes and colors that work well together. Choosing a variety of forms gives the garden more texture and interest. Examples of perennial forms include spreaders such as creeping phlox or sedums; mounds such as hosta or lady's mantle; and bold accents such as ornamental grasses or Petasites, Sweet coltsfoot, with its huge, showy leaves. When you plan your garden, you may decide to follow a particular color scheme. Monochromatic gardens are charming. Try mixing flowers of contrasting colors for a bolder look. As long as you like the way two plants look together, the combination is a good choice. Gardens have different growing conditions. There are dark corners; hot, dry areas; spots that are consistently moist or wet. No matter your situation, there is a plant type to grow there. Choosing the right plant for the conditions you have is important. It's important to properly prepare your garden before planting. Start by loosening the soil in the area that you will plant and remove any weeds if necessary. Avoid working the soil when it's too wet; you can damage the soil structure. Next, amend the soil with organic matter such as compost. You may want to work in some balanced organic fertilizer at the same time.Every time you add a new plant or move one from another part of the garden, take the time to work some compost into the soil. To plant, dig a hole large enough to accommodate the roots. Tip the plant out of its pot and loosen the roots with your fingers if necessary. Set the plant into the ground at the same depth it was growing in the pot. Refill the hole with soil and water the plant thoroughly. The best time to plant or transplant is on a cool, cloudy, or rainy day. If you plant on a hot, sunny day, be sure to give plants plenty of water and be careful not to let the roots dry out in the sun. Plants grow easily if you provide the basic care that they need. 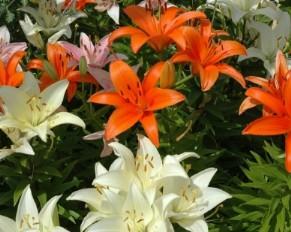 Important garden tasks include watering, mulching, dividing, deadheading, and fertilizing. There are two basic rules for watering. First, watering deeply is better than frequent, shallow watering. Watering deeply encourages plants to develop deep roots and improves their drought tolerance. The second rule is to water plants directly at the soil rather than overhead. Water sitting on the foliage can lead to disease. Using a soaker hose is an efficient way to water a garden. Watering is especially important for new perennials. They'll need extra water while they are getting established. A layer of mulch such as compost or shredded bark helps by controlling weeds and improving the soil. Mulch helps keep soil cool and moist, holds soil in place, and enriches it with organic matter. Spread a three-inch layer of mulch over your garden in late spring or early summer, after most plant stems have come up. Keep mulch away from plant crowns and stems.In areas with cold winters, you may want to protect marginally hardy varieties with winter mulch. After the ground has frozen, apply at least 6 inches of winter mulch such as straw or leaves. Remove winter mulch in early spring. Not all perennials need to be divided. But division can be useful to rejuvenate older plants or to control their spread. It is also an easy way to propagate new plants. Dividing is usually done in the spring or fall. The best way to maintain great garden soil is to add organic matter regularly. If you prepare your beds properly and add compost to them every year, you shouldn't need to fertilize anymore. If you follow these simple rules, perennials will reward you with their reliable performance and incredible variety of form and color.